“It was incredible to wake up to a full snowstorm in June,” Sigurd Bjåen of Hovden, in the mountains of southern Norway, exclaimed on national radio Tuesday morning. The heavy and drifting snow forced closure of several highways, with others open only for convoy-driving behind snowplows. 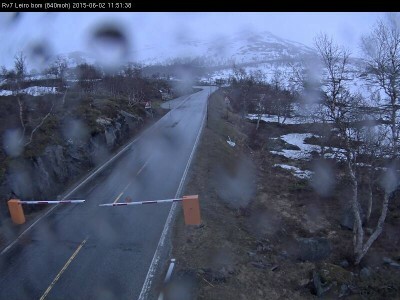 The state highway department (Statens vegvesen) warned of delays of up to three hours for those waiting to join convoys on Highway 7 over Hardangervidda, for example. 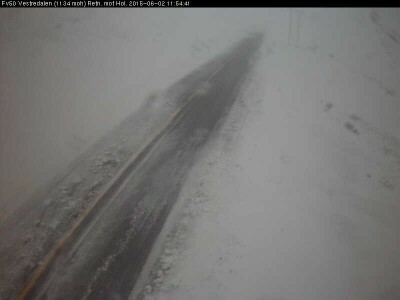 The main Highway 134 over Haukelifjell had to close again after briefly reopening Monday evening, and Highway 51 over Valdresflye was also closed. On Highway 55 over Sognefjellet, emergency crews had to rescue 39 people from 17 vehicles that got caught and partially buried by the snowstorm Monday afternoon. “We couldn’t see a thing,” Terje Weka, an experienced snowplow driver, told Norwegian Broadcasting (NRK). “There was so much wind and zero visibility. It was difficult to work, we had to just feel our way forward.” That highway was closed as well. Not only was the snow falling heavily with strong winds threatening trailers and other vehicles, highway authorities realized that most all motorists in Norway switched from winter- to summer tires weeks ago, believing that winter was over. That makes driving even more hazardous on slippery roads, leading to some closures that might not have occurred during winter itself. Bjåen lives just north of Hovden, known as a popular winter ski resort, and he can’t ever remember a worse pre-summer season than this year. Snow hasn’t fallen to such a degree, even in the high mountains, since at least 1967. 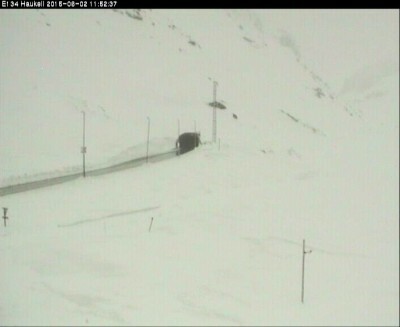 Some mountain passes that opened for the summer tourist and driving season just a few weeks ago have closed again. Several tourists driving camping vans from the European continent had to turn around at places like Brokke in Valle township because of closed roads. Many didn’t even make it to Norway: Gale-force winds along the coast forced Fjordlines to cancel its ferry service between Kristiansand, usually a summer paradise at the southern tip of Norway, and Hirtshals in Denmark. The storm in Kristiansand also toppled trees and tipped roof tiles off buildings, just as it did on Monday in the eastern counties of Hedmark and Oppland and along the west coast. The state meteorological institute was also maintaining warnings of torrential rainfall Tuesday in Vestfold, Buskerud, Telemark and the Agder counties, also along Lake Mjøsa in Oppland County. Residents were urged to take in garden furniture that had been set outdoors for the summer, and secure other loose items because of the winds. The weather was due to improve later in the week, at least around the Oslo area, but storms remained in the forecast farther north.